Most people never expect that they will receive a phone call asking them to help get someone out of jail by paying their bail. But, it happens more often than you might think, and it could easily happen to you. If you ever do find yourself in a position where you have to call a bail bonds company or a Tulsa bail bondsman, there are a few important things to keep in mind, so you can keep yourself safe and informed, and help out your friend or family member in the process. First, it’s important to understand the different policies and expectations of the bail bonds company you choose to work with. 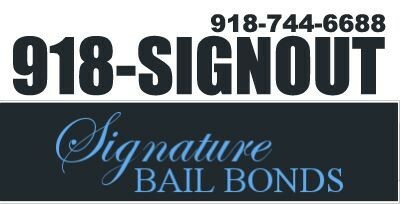 Signature Bail Bonds of Tulsa, for example, aims to be completely transparent in everything we do, and most bail bonds companies won’t be afraid to answer just about any questions you may have, since they’ll be happy to get your business, and want to be as trustworthy as possible. Some things to consider, for example, include asking your bail bonds company how much their premium is, upfront. That counts for the fee the company will take for posting the defendant’s bail in the first place. Some companies do things differently - some keep a steady premium, while some renew year after year. Be informed of the premium rate, and whether or not it will change, so you’re not surprised with a deeper payment later on. Many bail bonds companies also offer payment plans. Different companies will have different rules and regulations to these plans, so make sure you get as much information as possible when it comes to what they mean, what they offer, etc. It’s important to know how long you’ll have to pay the bail off through a plan, what interest or finance fees you may have to pay, and more. Again, asking questions will keep you from being surprised later on with extra fees you weren’t expecting to pay. Ultimately, it’s your choice when it comes to a bail bonds company you want to work with, so asking questions is a way to give you peace of mind. The more you ask, and the more information you can obtain from a particular company, the more comfortable you can be in your choice. You’ll want to find someone who can post the bail quickly, and locally, so keep that in mind throughout your search. If you find yourself in a position where you not only need to find a bail bonds company for the defendant, but actually co-sign on the bond itself, there are a few things you should know. Most importantly, you must know and trust the person you’re attempting to get out of jail. It’s extremely important to trust that they will not ‘flee’ on you once you’ve co-signed the bond, because at that point, it becomes your responsibility to pay it off. When you co-sign, you’re making an agreement to pay the bondsman’s fee, and you’re also agreeing to the knowledge that the defendant will show up for all of their court dates, etc. There is a lot of responsibility that comes with co-signing a bail bond, and it’s unfortunate that many people find themselves in a situation where they were simply trying to help, or trying to do the right thing, and get ‘stuck’ with someone else’s fees and bail amount. It can’t be said enough how important it really is to only help out with someone’s bail bond if you whole-heartedly trust that person. Their responsibility can become your own very quickly if they somehow manage to run away. It can be easy to feel overwhelmed if you’re asked to help someone get out of jail, whether that’s something as simple as a phone call to a bail bonds company, or something as personal as co-signing with a bondsman. But, as long as you stay ‘in the know’ as much as possible, it doesn’t have to be such a scary endeavor. In fact, utilizing resources like this blog and website, and other research on the Internet, you can inform yourself fully of the typical process, and how you can fit into it. Wanting to help out a friend or family member is not only a completely normal thing, but a completely noble thing. However, bail bonds can really test out a lot of trust, so while it can be easy to simply push ahead with the kindness of your heart, make sure you’re well-informed of both the risks and benefits that can come with helping someone get out of jail. It can be incredibly worth it, with someone you care about.